Deckscapes built this project just off of the golf course in Ballantyne Country Club. The challenge that we faced was to remove a very large, boring deck and transform their backyard to compliment the existing pool. Deckscapes started by first building the screened porch and deck area. We used Trex Transcend Decking in the Spiced Rum color for the floors. The rails are also Trex Transcends with white 6x6 columns, white rails and a Spiced Rum top cap. 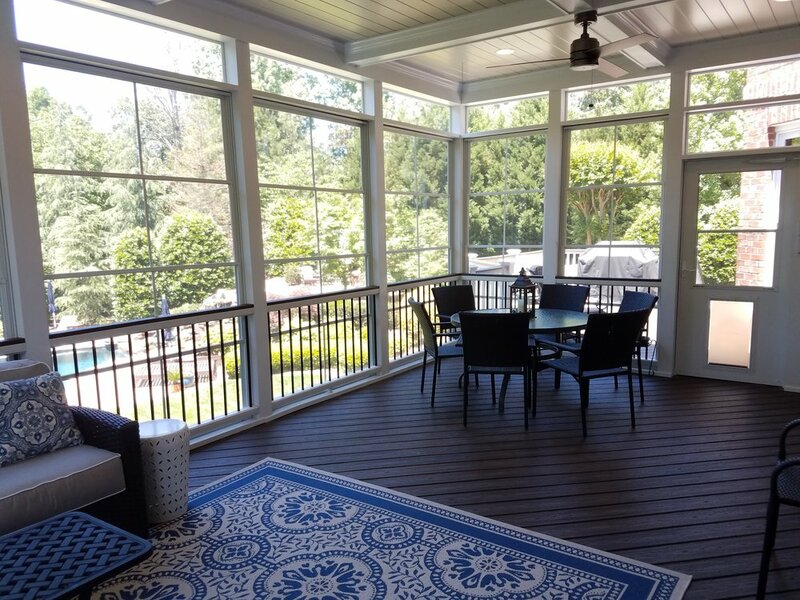 The deck, porch and stairs are all accented with white Trex trim boards to match the railing. Trex low voltage lights were added for accent lighting on the stair risers and the post sleeves. That completed the grilling and sun deck area. 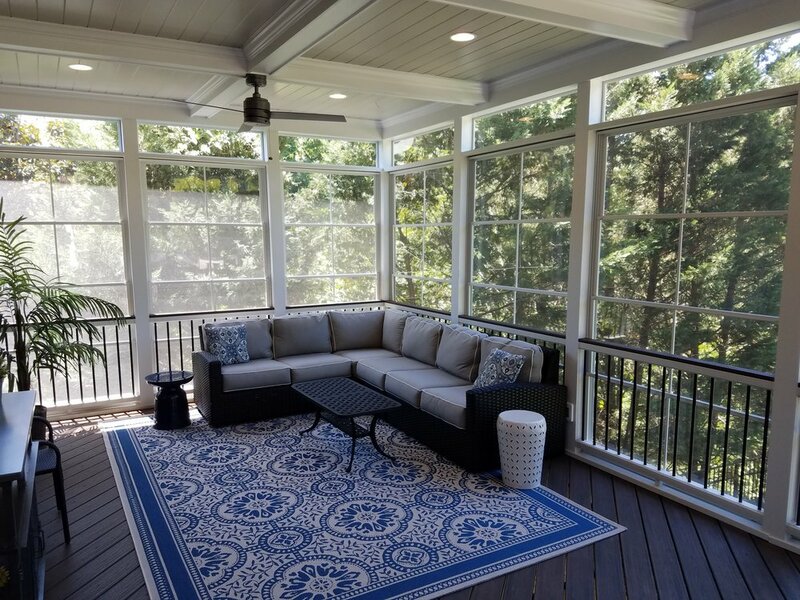 The screened porch was built with a flat roof (with a very slight pitch) and we added some modified Trex Transcends railing above the roofline to give the impression of a deck above the porch to match the deck rails. The porch walls are Cox 6x6 hollow laminated columns with matching Trex railing. 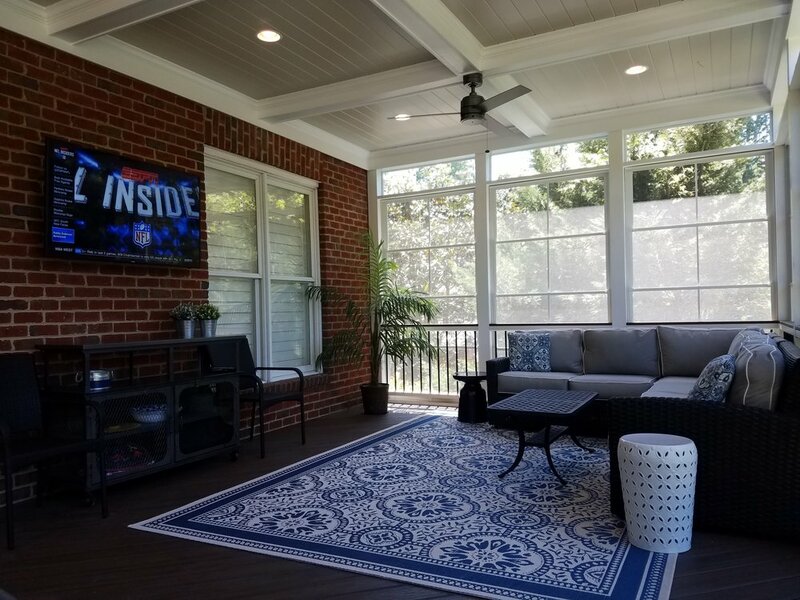 After the porch was painted with Sherwin Williams exterior paint we then added EZE Breeze porch windows to the exterior to allow the homeowners the ability to keep an open air feel or close the windows up to keep the room warm or keep dreaded pollen out. 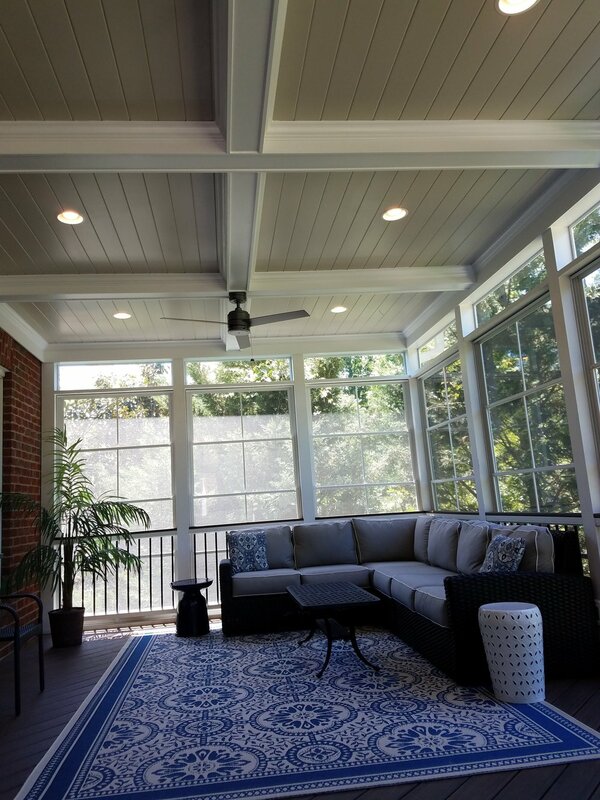 The porch ceiling was designed with the homeowners to create an amazing coffered ceiling look with two different Sherwin Williams paints. That ceiling really stands out and is the first thing you notice when you first walk into the room. Two ceiling fans and 6 recessed can lights complete the look above. We also added a flat screen TV along the back wall for a very relaxed feel. Below the deck and porch we were faced with the challenge of what to do with such a large covered space. We removed a very old, thick concrete patio and added approx. 700 square feet of Belgard pavers and had them blend in with the existing walkway for a smooth transition from the upper areas to the lower. We completed the project by adding river rock along the pavers and grass to help with a drainage problem that existed. 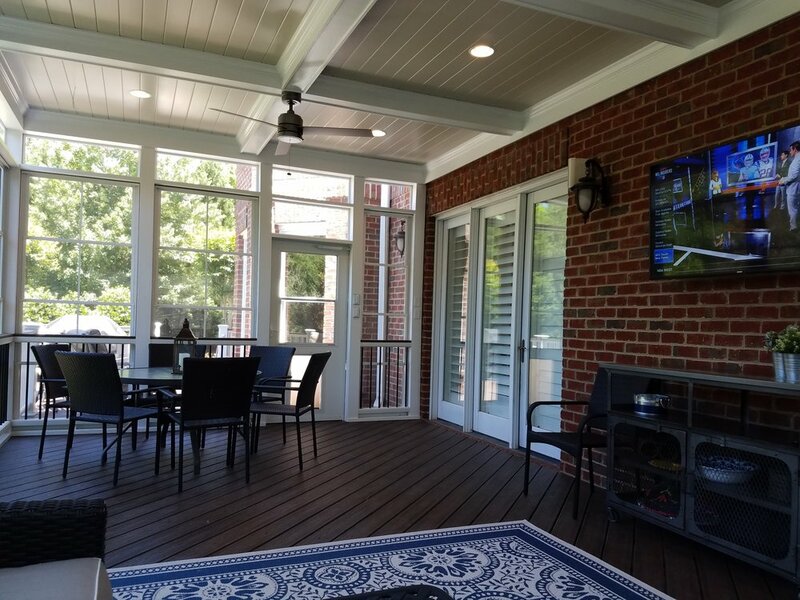 Whether sitting in the comfortable screen porch with a glass of wine, hanging out on the deck with a cigar and friends, or escaping from the sun down below on the paver patio, Deckscapes always does our absolute best to help you Enjoy Being Outside.